Rob Arnott’s Research Affiliates is a global leader in innovative investment strategies and research. Rob founded RA with the idea that there were better ways to construct investment models than traditional indexing. Today, his ideas of fundamental indexing, better known as “smart beta”, are shaking up the investment industry and his research has been influential in shaping many of my investment beliefs. For the the past two years, Rob and his team have been warning investors to expect relatively muted returns from many global asset classes over the next decade. 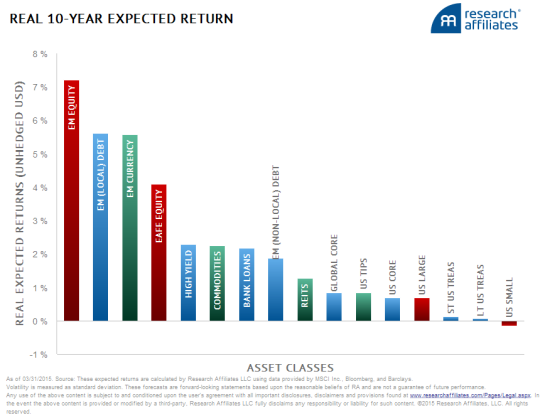 US Equities and US Fixed Income, two asset classes that the majority of US investors are most exposed to, are also two of the asset classes Arnott’s team is projecting poor real returns for . Rob says many developed markets are seeing early warning gusts of a what he calls a “3-D Hurricane”, the interconnected influence of demography, debt and deficit on financial markets. Rather than emerging from the 2009 recession with a period of rapid GDP expansion to make up for lost production, we have slogged through a time of slower-than-average economic growth. GDP has merely grown at an annual rate of 2.2% since 2009, and it is not accelerating; in 2014 the growth rate reached only 2.4%. A huge “shadow inventory” of unemployed workers hangs over the labor market, unrecognized in the official numbers. This shadow inventory helps explain the tepid wage growth we have seen even as the job market becomes tighter, and it will likely continue to keep a lid on wage growth going forward. Economic conditions, not Janet Yellen, set the long term equilibrium rate. As baby boomers age they shift their focus toward retirement, their emphasis on saving grows; An increase in the desire to save will result in a greater supply of investment funds, and exert downward pressure on interest rates. 10-year forecast is for real interest rates to rise from a current −1.38% to just about zero in 2024. The US economy is characterized by slow growth, unsatisfactory employment and a Federal Reserve not overly concerned with inflation. The idea of slower US growth in the coming years aligns with our own. Arnott’s suggestion for dealing with a “3-D Hurricane” is to avoid markets susceptible to it all together. Instead, he says, focus on emerging markets and inflation hedges such as commodities, TIPS, high yield bonds and REITs. We hold Rob and his team in the highest regard and believe these opinions are important to consider when deciding on suitable investments over the next several years.